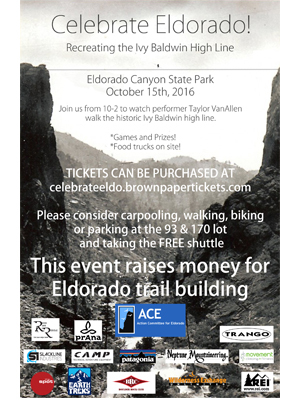 Join us on October 15th to watch performer Taylor VanAllen walk the historic Ivy Baldwin Highline. The slackline will span 600ft from the Bastille to the Wind Tower. 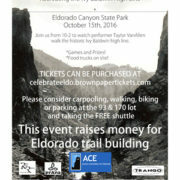 This event, in partnership with The Action Committee For Eldorado and Slackline Industries, will raise money for trail systems throughout the park. Food trucks will be in the lower parking lot and all prizes were donated by our sponsors. You can also purchase tickets at the event. http://aceeldo.org/wp-content/uploads/2016/09/R39AO-CLUB-poupee_LowRes.jpg 400 300 Stuart Paul http://aceeldo.org/wp-content/uploads/2016/05/ACE_logo_564x396.png Stuart Paul2016-09-21 13:02:012016-09-23 13:38:55Celebrate Eldo!